I should, hopefully, have something to share with you tomorrow night and if not, then on Thursday as we are winding things up for the GALA event!!! Tonight's "scrapatit" is a BIT different and you will see just how so right away!!! I've scrapped a few more photos from our BIG family picnic on Easter Sunday at Osage Park. These photos are of Papa (my darling Robert!) and grandson number two, who was the FIRST of three born last year!!! Dillon had just celebrated his FIRST birthday the Saturday before Easter!!! I'm sure y'all remember how I tripped up on the time and we missed this MOST special celebration!!! Oh, I SOOOO need a NEW brain sometimes!!! He, he .... if not ALL of the time! 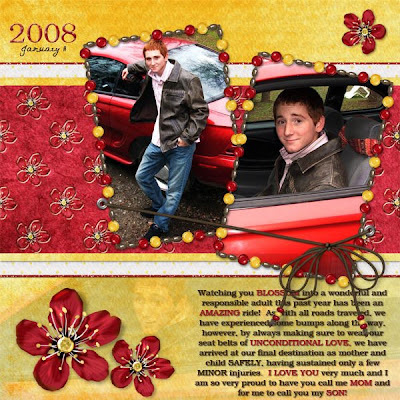 Anyhoo, there is space for a photo the length of the page and a bracket frame tucked beneath torn and curled paper to another photo OR you can place a paper beneath it and use it for journaling. You could also place a paper beneath the larger opening and then erase it from inside the bracket frame for just one smaller photo. 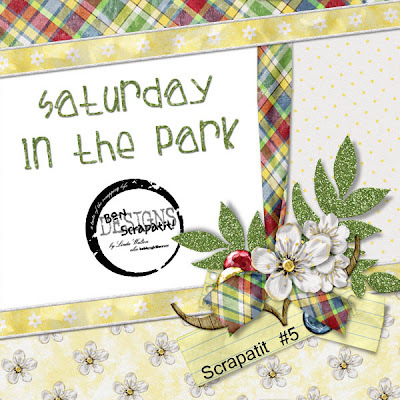 I am trying to make the majority of the "scrapatits" fairly simple so that y'all can add your OWN touches with what you have collected from the *Saturday in the Park* collection as you have SO fondly named it!!! 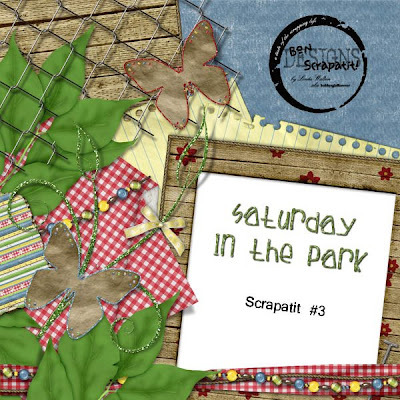 You are SO sweet and I LOVE making scrapatits for you and, again, it is causing for me to get some scrapping done as well!!! I am LOVIN' it!!! By the way, I'm sure you all figure that the reason I am not putting titles and dates on all of my pages is that they will go into an album and the story will be told with a title page or two consisting of the date, the event and such. Having done CT work for several years, I had become accustomed to titling and dating each layout I did, but soon realized how silly that will look in an album full of pages that are all from the same occasion!!! Live and learn! LOL! Oh, ONE more thing before I head off to bed. Some of you may be wondering about why you are not finding a few of the items that I am using in the "scrapatits" in your collection. Well, while I try to use only from a kit or in this case, the SITP collection (LOL! ), once I've acquired enough to put together in a preview, I shall give them as a FREE download as well. Fair enough? I think so!!! Y'all deserve it for being so nice as to share your WONDERFULLY creative layouts with me and ALL of SCRAPLAND and for responding to my periodic questionings!!! You are simply THE BESTEST!!! See you lovelies tomorrow and THANK YOU, THANK YOU for taking the time to leave me such WONDERFUL digital scrapping organizational tips!!! I am VERY familiar with ACDSee and was actually a test pilot of sorts when it first came about under a different name and before they had all of the bugs worked out of it, they were taken under the ACDSee umbrella!!! I will have to take a closer look at it just as soon as I have a bit of time to play!!! I do like your methods and most of them have been in my head, just not put into practice as yet. It seems I've always been involved in doing SO many things that it was all I could do to download what I'd purchased and unzip it into the specific designer and store's file. I REALLY wish to sort by color, theme, elements and such more than I can say at the moment!!! Night all, sleep tight and don't let the .... thoughts of what to scrap next keep you awake!!! He, he .... (I bet you thought I was going to say, "don't let the bed bugs bite", didn't you??? ROFL! As my kiddos would have said several years ago ..... PSYCH! STOPPING IN TO SAY HELLO AND TO LEAVE YOU WITH ANOTHER FREEBIE!!! WOO HOOZY DOOZY!!! ROFL!!! I won't EVEN try to tell you that this will be a quickie as WE all know it won't be, right??? LOL! I figure if I don't say anything, then I shall be short and sweet tonight!!! Shhhhh .... you did NOT hear a thing I just said, DID YOU??? Well, FIRSTLY, I hope to find y'all doing well and getting some MAJOR scrapping done with *Saturday in the Park* and ALL the other goodies you are finding. You know, I don't get out much anymore so if y'all find something IRRESISTIBLE that you just think I may NOT have seen and that I might be interested in, please HOLLER at me and let me know where I can find it!!! LOL! Yeah, while I don't grab near as many as I used to "back in the day", I still find it hard to pass some things by and there are some INCREDIBLE designers here in SCRAPLAND gifting us with some ROCKIN' stuff!!! I purchase a lot as well, especially commercial goodies!!! I would REALLY be embarrassed to tell you just HOW much stuff I've accumulated over the past 3+ years and how little of it I've actually had the opportunity to use. Although, one day I am sure that things will change and I might just have a WHOLE LOT of time to scrap!!! Now there is a MOST pleasant thought!!! I REALLY love designing so I need to find myself a "balance" sometime here in the near future so that I can enjoy the BEST of BOTH worlds!!! 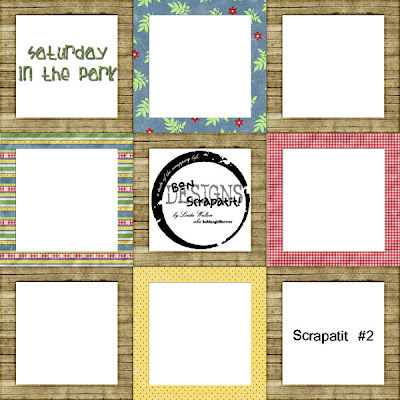 I know I mentioned it the other night, but I am getting a few things scrapped by making "scrapatits" to give out!!! Although, I am SURE that y'all are going to tire of them VERY soon!!! I shall start working on some new things once National Scrapbooking Day has past and y'all will be WAY too busy organizing ALL of the new goodies you get to really even think about what I might be up to!!! ROTFLMBO! Oh, one more topic I'd like to bring up quickly before I say "good night" - how do y'all organize your scrapkits? By designer? By theme? Color? Do you separate papers and elements and then organize your elements by type? What system makes YOU most productive in your scrapping? This inquiring mind would REALLY like to know!!! Thank you! 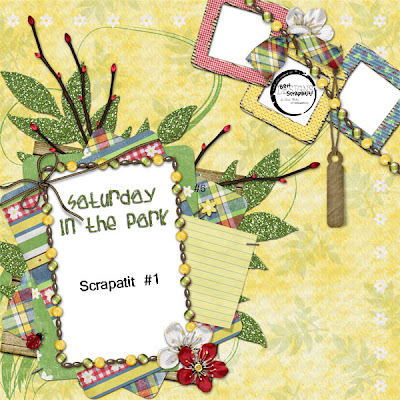 Tonight's "Saturday in the Park" scrapatit is another WONDERFUL addition and I had a SPECIAL time scrapping with it! 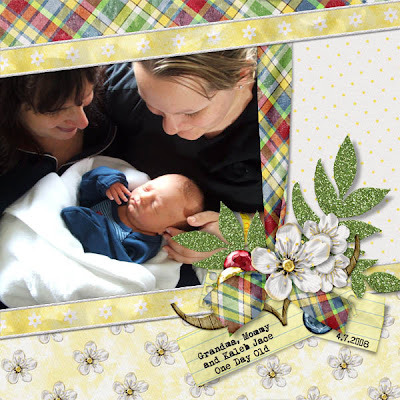 I've been putting off posting new photos of Kaleb as I've been SO busy, so I thought I'd be just a WEE bit creative in scrapping this SWEET photo of my darling grandson on my visit to his home as he celebrated his FIRST week of life! ENJOY and I just might give you a SNEAK-PEEK at some of the goodies I will be offering during National Scrapbooking Day at 3Scrapateers!!! I am SLOWLY creeping off of third-base and coming in for a HOMERUN!!! Ms. Carole, if you are reading this, I hope to have some goodies to you sometime before noonish for our chat Saturday night!!! Oh boy, I am getting SOOOOO excited! Y'all will be too, I just know it! Have a TERRIFICALLY delightful Tuesday everyone and I'll see you tomorrow night and I thank you all SO very much for ALL of your LOVELY and TREASURED comments!!! You are SOOOOO awesome! celebration of National Scrapbooking Day??? OH BOY! Thank you, thank you my DEAREST ones!!! 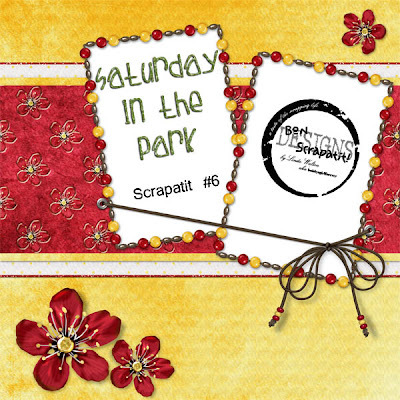 Your comments have kept me going this weekend as I've been bustling to prepare my goodies for National Scrapbooking Day at 3Scrapateers this coming Friday through Sunday!!! I've been up and down with a wee bit of nausea but mostly just feeling weak and, YES, Nancy, you hit the nail on the head with the CT scan kicking off the fibro flare!!! It kicked in before leaving the hospital parking lot! Oddly enough, I've not dealt with fibro much for a while (as you said, keeping it under control!) and I suppose between the pain from whatever is going on PLUS the CT scan procedure, I've been aching from head-to-toe since Thursday. EVEN my feet hurt! And this too SHALL pass!!! On to BIGGER and BETTER things! As I am working my hardest to wrap up my preparations for NSD, I will post and "ad" of sorts to let y'all know what I will be doing by way of "chat" and "challenge" for this MOST wondrous event, so STAY-TUNED!!! For those of you who have NEVER attended any festivities at 3S in past years for NSD, CLEAN out your hard drives as we have TONS of FREEBIES for your downloading pleasure starting with the KICK-OFF chat Friday night!!! I will post the time when I give you the details. I believe the KICK-OFF is at 7:00 pm EST and, of course, will be located in the 3Scrapateers' chatroom! (Rumor has it, there will be some EXTRA surprises being given out!) You will find a DIRECT LINK to the chatroom just below my scrapkit slide presentations over in my sidebar to your right. The THEME for NSD this year at 3S is "A Scrap For All Seasons"! YEPPERS, that means the FREEBIES will consist of goodies for scrapping ALL-YEAR round - Winter, Spring, Summer and Fall! WOO HOO!!! I guarantee this is NOT an event to be missed!!! 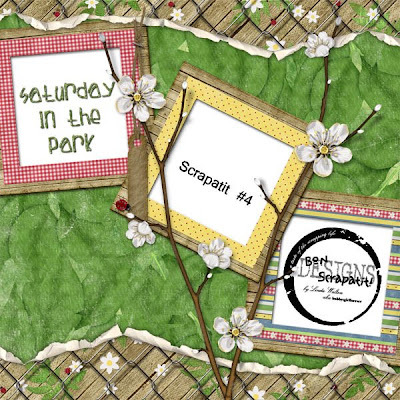 Tonight's "scrapatit", as you can see by my layout, is another FUN addition to *Saturday In The Park* and was PERFECT for a photo from our family gathering at the park on Easter Sunday. We had a GREAT time watching "ohana" (family) playing softball and peering through the "chain-link" or "cyclone" fencing!!! Now y'all know why I just HAD to create the fencing overlay!!! Ya just gotta LOVE Hawaiians - MANY of the gentleman played in their LOCALS (flip-flops), including Robert's oldest son!!! LOCALS are actually a fairly spendy pair of thongs, as I used to call them as a girl! We had such a GOOD time and I'm a bit sad as we had to miss Robert's brother's birthday party today since I've not been well. I TRULY treasure the time WELL SPENT with this family! Thank you for letting me know whether or not you had to use a password to download. This is getting VERY interesting now and I am MORE confused than ever (is that really possible??? shhhhh!) as some of you HAD to and some of you DID NOT have to!!! ROFL!!! Gotta LOVE the opportunity for a GOOD chuckle! Have a SUPER week everyone and I will start posting NSD info in a few days!!! patch. Thank you SO very much - y'all ROCK!!! 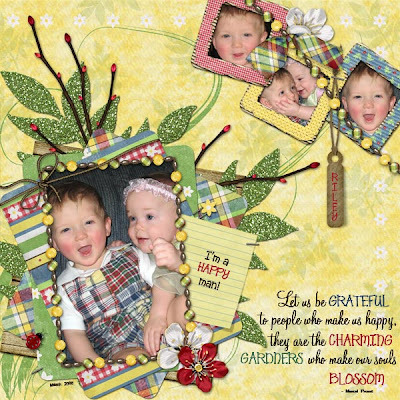 IT'S FANTABULOUS FREEBIE FRIDAY ONCE AGAIN HERE AT BON SCRAPATIT DESIGNS!!! I won't stay long tonight as I am still recovering from my CT scan Thursday morning!!! PHEW! I really had NO idea what I was in store for, otherwise, I would have better prepared myself! Having had an angioplasty preceded by an angiogram three years ago, I should have figured they would be shooting dye into my veins at some point!!! But, NO! I've been SO busy with everything else, I failed to do my homework this time around!!! I ALWAYS do my research so that I am privy to any given procedure, etc. It surely helps to better prepare oneself, eh? Anyhoo, I had to swig down a bit more of the "yummy" milkshake upon entering the x-ray room and had a WONDERFUL chat with the x-ray tech!!! Funny how I just seem to chatter away no matter where I am!!! ROFL! She was a VERY delightful young lady and we talked about raising children, the world as it is today, what it might be like for the children inheriting it tomorrow and, OF COURSE, digital scrapbooking!!! I felt very weak afterwards. Luke and I stopped off for a visit with Mark, Jessica and Kaleb!!! He was in he living room in his bassinet and looking SO sweet! I don't think I can think of better therapy at this point-in-time than holding my grandson. Yes, I did take more photos!!! I'll try to post a couple with your FREEBIE tonight. If I don't get them up, I'll do so tomorrow. When I arrived home, I went straight to bed. I told Luke that I felt as though I'd been beat up. Pretty much the way I feel when I go into a FIBRO flare-up, which it very well could have been. I slept all day, got up when Robert arrived home from work and could NOT drag myself to the computer so I reclined in the living room and watched a couple of movies with Robert before going back to bed for the night. I was awake shortly after 8:00 this morning, but only lasted about an hour and a half or so when I climbed back into bed due to some serious nausea. I tried to drink as much water as I could, but kept feeling sick plus I had a whopper of a headache. I very rarely get headaches so I took some Ibuprofen and it wouldn't touch it. Hmmm ..... where oh where did the day go??? I slept it away, but I have to say, it felt good to do so!!! I should get the results of my scan sometime next week and I will let you all the GOOD news as soon as I have heard!!! How's that for positive thinking!!! THANK YOU, THANK YOU for all of the NEW additions to the slideshow today!!! Y'all just know how to make me smile and it definitely helped to lift my spirit when I was finally able to sit down and read some e-mails and to work on another "scrapatit" for y'all. Wishing y'all a BEAUTIFUL weekend with your loved ones and I thank y'all for your positive thoughts, prayers and well-wishes. How can I not get a GOOD report!!! 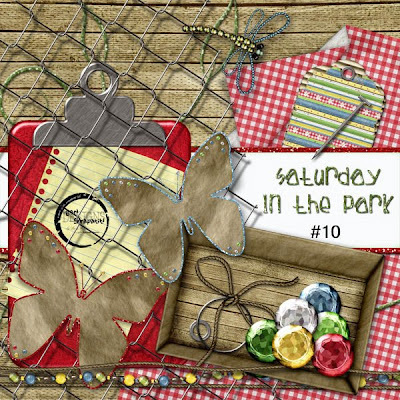 Layout created by me using my Satuday In The Park. Photos courtesy of me. Fonts used: Leaf Queen Script and Librairan. I still wish to see more of your masterpieces! Thank you! load as to whether or not you had to enter a password. of, "To use a password or not to use a password"!!! Another short visit from me tonight as I prepare to put myself into bed early for an early morning arising! I am posting to y'all and drinking the last of my liquid (lemon water!) until I have to swig down the CHALKY milkshake (RediCat ... LOL ... would you believe as I just typed the word RediCat I looked over at my kitty, Snickers, sleeping on our bed? LOL! Yeah, I'm sure you know what I was thinking ... Ready, cat?) so that I will glow like a light bulb on the inside!!! ROFL!!! I'm sorry. I am such a visual person and my visual perception of this is rather humorous!!! Okay, enough of my RUM DUMMY stuff (yeah, I know, I should post earlier in the day when I have some wits about me!!!) and on to the GOOD stuff! 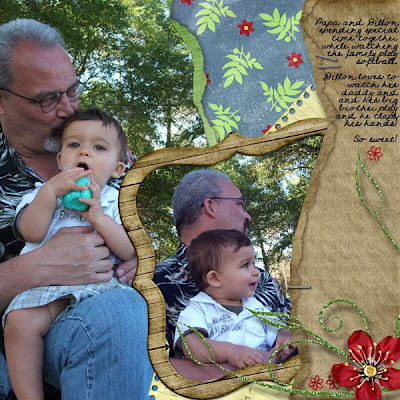 I actually deviated away from our picnic in the park on Easter and scrapped a photo of me holding my new grandson, Kaleb Jace, right after he had arrived home from the hospital! Kaleb was two weeks old on Monday and I've not seen him in over a week! Luke and I will stop by to say "hello" to mama and baby boy after my CT scan as they are right on our way home from the hospital I will be going to. 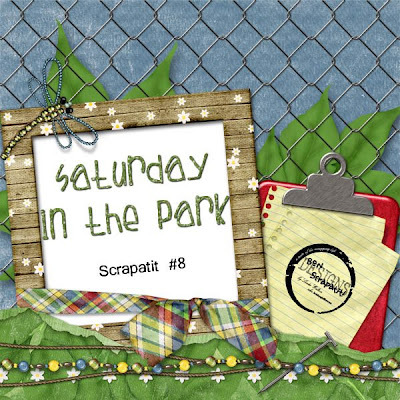 So, without further ado, here is Scrapatit #5 from *Saturday in the Park*. Thank to those of you who added your layouts to the slideshow today!!! Y'all ROCK ... and then SOME! Sweet dreams and I hope to see y'all tomorrow night! Have a BEAUTIFUL day!!! proper working order. You will NOT need a a password! LOVE to see your layouts when completed!!! Thank you! How's everybody??? Just thought I'd stop by and drop off a little something for you whilst I am working on my NSD goodies!!! I have to admit that I am just a WEE bit on the anxious side awaiting my CT scan early Thursday morning. I am normally a rather patient and calm person, but I suppose the chronic state of being uncomfortable and/or in pain has me biting at the bit to get 'er done!!! So, just a quick "drop off" and I am off and running .... LOL ... I mean off and designing!!! Silly me! It must be what time??? Uh, huh ... RUM DUMMY HOUR!!! Only 20 minutes to go! 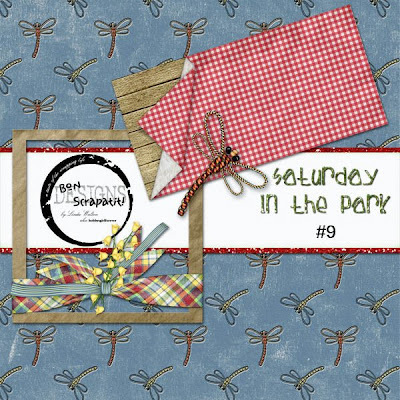 I would like to, once again, thank EVERYONE who has contributed layouts to the *Saturday in the Park* slideshow!!! I am just LOVING IT!!! By the way, thank you to the couple of you who have taught me something new! It was not until I received notification via e-mail from SLIDE.COM and looked closely, that I realized you can simply CLICK on the slideshow and add your layout to it. Once you have added it, I get an e-mail to approve you ADD!!! Is that TOO cool, OR what??? I told you and I keep telling you .... I'm "a day late, a dollar short and THE LAST to know"!!! ROTFLMBO!!! Ya think perhaps I've jinxed myself!!! the park where we had a WONDERFUL family get-together and bar-b-que! me see your CREATIVE touches when you are finished! 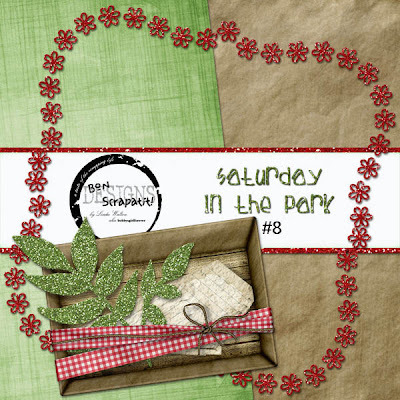 IT'S FANTABULOUS FREEBIE FRIDAY , SUPER SATURDAY SURPRISE AND THE FINAL INSTALLMENT OF *SATURDAY IN THE PARK*!!! Note: I was unable to get this post uploaded last night as, for some reason, Blogger was not taking my images! Sorry, first time I've ever had THAT happen to me on Blogger!!! Have a GLORIOUS weekend everyone! Please see additional note below download image for update on links and the MISSING BOX!!! OOOPSIE! I'm usually not SAD to see the end of my designing of any particular kit, but for SOME reason, I'm having a difficult time with this one. I'm thinking it might have something to do with my not feeling so great the past few weeks and my inability to "lock-down" and focus for long periods of time and I am SURELY hoping that this "inability" passes quickly!!! It's almost as bad as being in a FIBRO FOG!!! Thankfully, I've not dealt with that for a while and I think y'all are getting to know me well enough to know that I have a bit of (okay, A LOT of) stubbornness in me mixed in with PURE determination that I WILL conquer ALL that ails me!!! Point-in-case, I was BOUND and DETERMINED to include some reasonably realistic CHAIN-LINK fencing (y'all were close, but NO cigar! YUK, you wouldn't want one of those anyhoo!!! EWWWW! *grimacing*) in this final installment because I have several photos to scrap from Easter of the family divided up into teams playing softball and of those of us cheering them on, including our DARLING grandson, Dillon! I created my own template one link at a time until I had a row. I then merged visible, duplicated the row and as many times as I needed to complete a 12x12 page and then resized to fit proportionately. After saving my template as a PNG file to save transparency, I ran Atomic Cupcake's "pewter" action to give it a somewhat galvanized appearance. The detail-oriented person that I am had me looking at the chain-link MANY times throughout the day trying to figure why I could not get it to look like REAL chain-link!!! I shall work on it another time to see if I can improve upon it, but for now, I am satisfied and I hope y'all like it too!!! It'll come in handy for LOTS of layouts including baseball, the park (of course! 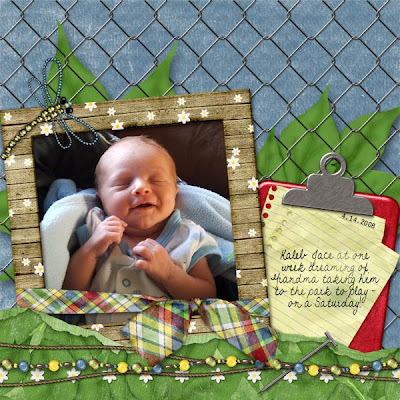 ), gardening, putting up a chain-link fence or any layout that will include photos with chain-link in them!!! And don't hesitate to crop it to suit your needs! 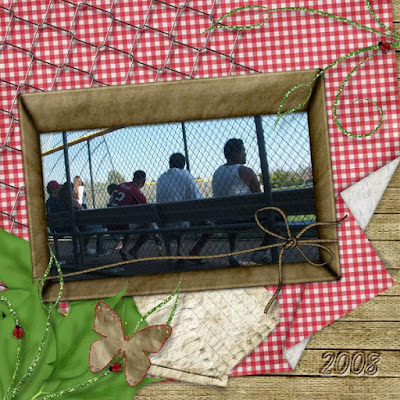 HAPPY BIRTHDAY to Mom Soto from http://www.wersoto.com!!! 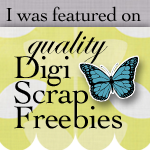 She has been a busy, busy scrapper and posts a layout on her site everyday for a challenge. 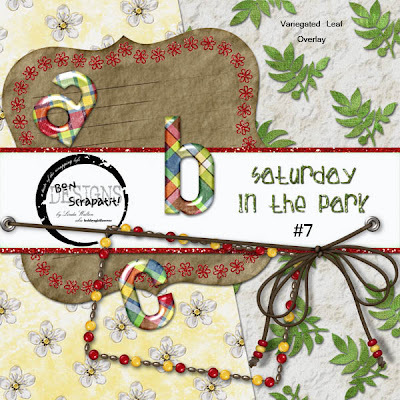 She has already sent me four or five (I've lost count) layouts using *Saturday In The Park* and I hope to get her layouts, as well as those from the rest of you that have either sent them to me or posted links for me to follow, put into a slide show this weekend!!! WOO HOO!!! Thanks SO much y'all!!! Y'all ROCK ... and then SOME! I am SO loving it!!! Mom Soto is also a designer and has some VERY lovely kits for sale and you will even find some WONDERFUL freebies on her site. Check it out and please make sure to leave her some lovin' and you can even tell her that I sent you over!!! You can use the link above and I will be posting the link on my sidebar too. WELCOME home Tink!!! SO nice to have you back! I've missed you!!! Hope you accomplished ALL that you set out to at Nuke's this time around! I shall try to visit your blog SOON darlin'!!! He, he ... nice thing about the Internet, you can go away for months and no one would even know it, unless of course, you make it known!!! Thank you SO much for sharing your family's geographical challenges. While a few of you ARE close to loved ones, MOST of us are not and I agree TOTALLY with Livia, thank goodness for the phone, IM's, web cameras, e-mail and the Internet period!!! Which reminds me, I've just got to get myself caught up so that I can reply to one of my older brothers who has been trying to reach me (If you are reading my DEAREST brother, I will contact you ASAP!). This is just a CRAZY month for me and I've got to get 'er done!!! I actually have several family members I need to reply to! For my finale' to *Saturday In The Park* tonight, you are getting several goodies. 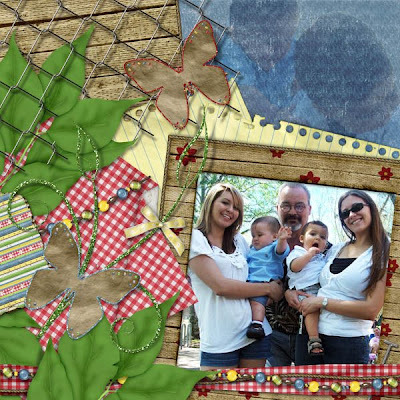 There is a WOOD background, a folded gingham table cloth AND a chain-link overlay!!! I am including a "plain" wooden box for y'all to decorate as you wish or you can even use it as a photo frame, two brown bag butterflies trimmed in glitter and embellished with tiny jewels, another dragonfly to match the background paper from #9, a metal T-pin, a torn paper and cardboard tag, COLORFUL jewels, a pewter eyelet and jump ring (you can hang goodies from the chain-link fencing! ), a tri-colored bead strand, a straight and a wavy rope with a matching bow (this is the same as the ensemble in #1 but separate pieces), a green GLITTERED flourish and a RED grunge and epoxy clipboard, hardware and crumpled and folded spiral note paper!!! PHEW! That was a pretty long list!!! Below I am posting a preview of ALL previews from 1 - 9 (minus the scrapatits and more of these will be sure to follow!) for any of you who might be missing some of the downloads. All downloads will remain active until I post something new that is not related to *Saturday In The Park*. I figure all links will still be active for several more days, if not a week. If you know anyone else in your scrapping circle that might like these goodies, please send them on over before they are gone! 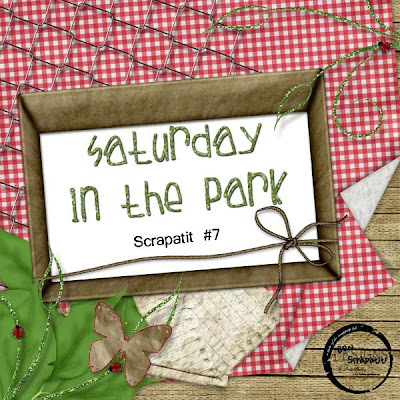 I will most likely upload *Saturday In The Park* to my stores prior to the Fourth of July!!! "Saturday, in the park, I think it was the Fourth of July"!!! It'll be a GREAT kit for scrapping your Independence Day get-togethers and summer picnics and/or park adventures!!! SWEET DREAMS y'all - have an AWESOME weekend and may you SCRAP A LOT!!! the downloads into two since it was such a large file! Sorry! links have been tested and are ALL in proper working order. ROTFLMBO!!! Yeah .... I KNOW!!! That's pushing it a bit, eh??? I told you I'd come up with acronyms for every day of the week!!! AND, since y'all did not toss any suggestions my way, I had to STRETCH my brain within a minute bit of time to come up with this one!!! Yes, sleep awaits me and I shall not torture you long - I hope! Had an unexpected phone call from my darling daughter number two and had the pleasure of her company for nearly two hours. I NEVER complain when my girls call as we are all so busy and time "well spent" is rather rare these days! Funny, as I was speaking with Robert's number three son earlier today and it is becoming the popular vote amongst most of us that if we win the lottery (or come into a fortune some other way), homes will be built for ALL family members and we will revisit the days of LONG ago when everyone lived on farms and could jump into the wagon and go visiting at least once a week!!! All kidding aside, I think it would be GRAND to have family close by. My girls have often used the word "disconnected" when speaking of their distance from family. I'm sure we don't think about it during the hustle and bustle of the day, but when all is said and done and we have a moment or two to reflect, we do feel somewhat disconnected from those we don't see nearly as often as we would wish to. What are your feelings about families being divided by geographical differences? I'm sure there are some that have a family member or two that they prefer living across town or even in another state!!! Heck, maybe even out of the country, but for the MOST part, wouldn't you like knowing that you could make a phone call and stop by to visit that new grandbaby after work any day of the week??? Hmmm ... wonder where that question came from!!! Give you ONE guess!!! LOL! I do realize that some of you already have the ability to see your LOVED ones on a regular basis, but I venture to say that MOST of us today do NOT have that privilege or pleasure. So much for being a "stone's throw" away, eh??? LOL! Okay, enough from the peanut gallery. I will zip my lips. Or should that be, freeze my fingers? YES, YES, YES .... you have guessed correctly!!! RUM DUMMY hour has arrived and right on time as it is nearly midnight my time! I'm rattling and I need to hush and give up the goods, don't I??? Okay, here they are. There is ONE thing that I've yet to create to complete *Saturday in the Park* and I am not going to be content until it's been done and done correctly at that!!! No, I'm not telling, but I will give you a hint. It will be something you can use in the background and it is something that you would probably find at MOST larger parks. Something that is used to protect children and adults alike from flying objects!!! Any guesses??? Why am I SO adamant about including this item in this ONGOING kit??? Because I REALLY, REALLY want it to scrap MY Easter photos with when we all gathered at the park for a bar-b-que and WONDERFUL family fellowship ... and played games even!!! Tonight's FREEBIE includes a dragonfly background paper, a gingham cloth covered picnic table matte, a beaded dragonfly and a wrapped frame!!! ROFL! Before long, I will have acronyms for each day of the week!!! If you have any CLEVER ideas, PLEASE send them my way as my brain is a bit cluttered at the present time! HOW ARE Y'ALL??? Everybody have their taxes filed??? Robert got his mailed by the skin of his teeth, or should that be by the soles of his feet as he darted from car to post office!!! He, he ... Good thing he called me and I told him that the post offices closed at 4:30, otherwise he would have had to drive an hour and half to get them mailed in Stockton! PHEW! He's just glad they are done. Not his fault they were in at the last minute either. That was MY bad! Too busy with SO much other stuff and I kept dragging my heels on those taxes!!! Now there's a sight for sore eyes, me sitting on my backside IN my computer chair and dragging my heels!!! EEEEEKS! Anybody have any funny tax stories to share??? Perhaps not funny at the time, but in retrospect, they bring a good chuckle nowadays!!! Please bear with me - I've got NEW photos of Kaleb to share from my visit with him yesterday as he celebrated his FIRST little week of life outside of his womb! He is SOOOOOOO sweet and such a GOOD baby boy! I will try, TRY my darndest to get them up tomorrow!!! I almost canceled my trip as I was not feeling well at all, but I did NOT want to miss a one week photo shoot and I thought Kaleb would be just the medicine that Grandma could use for the afternoon. I was right - he did the trick for me!!! Holding a tiny miracle, NEW life in my arms - CANNOT get ANY better than that! NOPE, not even a trip to the Caribbean comes close!!! I made it to the clinic this morning for my appointment. I am a bit behind tonight so I will catch y'all up tomorrow. My in office exam was good on the surface and we will be awaiting test results. I was THRILLED at my blood pressure even knowing that my body has been stressed due to all of the pain and I'm sure I have been too, more than I would like to admit on a conscience level! BP was 104/68, which is actually a bit lower than my norm of 110-112/70-72. I was HAP, HAP, HAPPY about those numbers. Oxygen reading was 99%, so my blood is flowing nicely!!! Doing a REAL big HAPPY DANCE on that as one who has been stented!!! I will be going for all of the typical OVER 50 goodies: mammography (that's actually 40+), colonoscopy (oh JOY! ), bone density test (I'm looking forward to this one!) and Stephanie wishes me to have a CT scan done of my abdomen JUST to make sure nothing is being missed!!! I just LOVE this woman!!! When I mentioned to her that I am STUBBORN and wish to hang onto all of my innards, her reply was, "Most of those into holistic medicine feel that way - God gave you everything you needed and you don't want to lose any of it!" WOO HOO - it feels SOOOOO good to have a medical professional who relates to how "I" feel!!! WHOOPEEEEEE!!!!! Okay, now for YOUR medicine .... er, uhm .... I mean now for your TREAT!!! 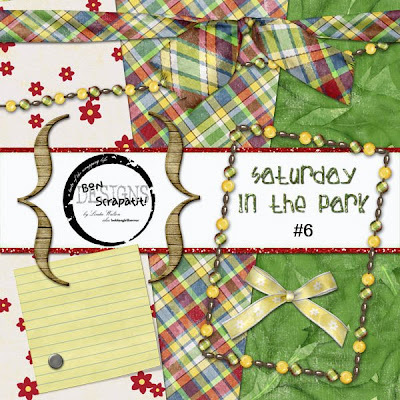 I have DESPERATELY wanted to give Monica Larsen's new "In a Box" action a try and this was the PERFECT opportunity and fits VERY nicely into the *Saturday in the Park* theme! I had to toss in a bit of grass stain and crumpled piece of brown paper bag as well as the GLITTERED floral border that I gave you attached to the brown bag journal matte last time! 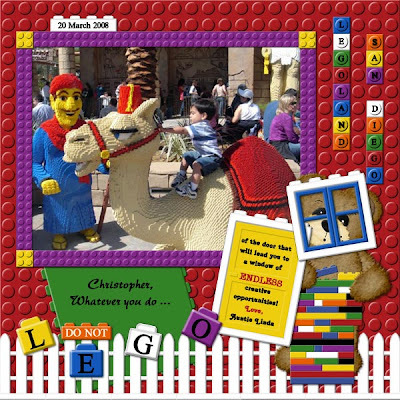 I thought it would be nice to have to use as a page border or even as a frame around whatever! I tried not to gussy up the decorated box TOO much so that you can add flowers if you wish and/or the lady bug or anything else that your heart desires, OR just leave it as is! Have FUN! See you tomorrow night, God willing. I've not felt like doing much of anything the past couple of weeks, so I am hoping that I can focus a bit better now and get my projects completed so I can start making some NEW kits!!! Nighty, night y'all! Sweet dreams - may they be SCRAP HAPPY ones!!! YOU ARE THE MEANING IN MY LIFE - YOU'RE THE INSPIRATION! This has been a WONDERFUL beginning to April for me and reminiscing about days of old with y'all and the FABULOUS band, CHICAGO!!! I'm SO happy that y'all are enjoying *Saturday in the Park* as much as you are! I think it has quickly become one of my favorites as I just LOVE the outdoors, springtime, warm sunshiny days (moderate temps of course!) and the smell of FRESHLY mowed grass as well as ALL of the BEAUTIFUL budding blossoms! I was just listening to "You're the Inspiration" and have SOOOOO enjoyed ALL of the SHARES from y'all the past few days and thought I would use this song as to pose yet another question! First I'd like to let you know just how MANY ear-to-ear grins you've put on my face as I read your SWEET memories of the PURE innocence of the children in your life! WHO is the MOST influential and/or inspiring person in your life? Has he/she always been? Have you had MORE that one person who has made a HUGE impact in or on your life? Before I forget .... NO!!! We have NEVER known what April meant when she said, "peace molly hops"!!! I just spoke with her last night and it was a good stroll down memory lane for her as well and she got a little chuckle out of the fact that SHE KNEW what she meant back in the day, but has NOT a clue what her little mind had concocted at the age of two!!! ROFL! She told me that we'd have to go back to April at that time and ask her!!! O - KAAAAY! Let's just do that! Wouldn't that be TOO cool to have a contraption to transport us momentarily back in time like in "Back to the Future"??? WHOA! That would be trippy for sure! Uhm, hon, remember when so and so said such and such? No. Well, let's go back and and recapture that remark, story, etc.!!! ROTFLMBO!!! Okay, I know what you ALL are thinking!!! Linda is well on her way into her RUM DUMMY hour!!! I think you're right, so I'd better finish up and get myself to bed! 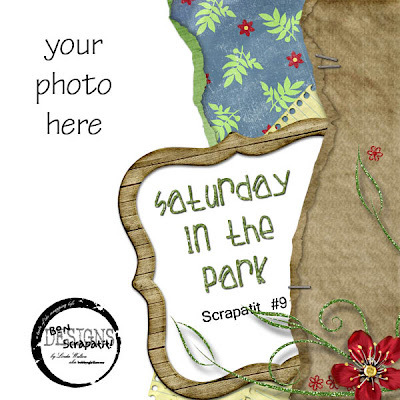 How many of you have completed a layout and/or project using *Saturday in the Park*? THANK YOU to those of you who have already sent me something and/or posted links for me to view!!! You are SO awesome!!! If y'all don't mind, I am going to snag your masterpieces and put them into a slideshow down below where the others are, only this one will be EXCLUSIVELY for layouts and/or cards and other projects using ONLY *Saturday in the Park*. 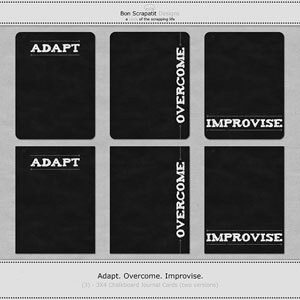 For those who have not yet had the opportunity to scrap anything, I'm going to "inspire" you a bit with SCRAPATIT #1!!! And, YES, please plop in some of your favorite outdoor photos add a little journaling and/or title and send it to me so I can post them in the slideshow as well!!! I just LOVE seeing what you create!!! I am posting below a layout (look Tink, Linda scrapped!!!) 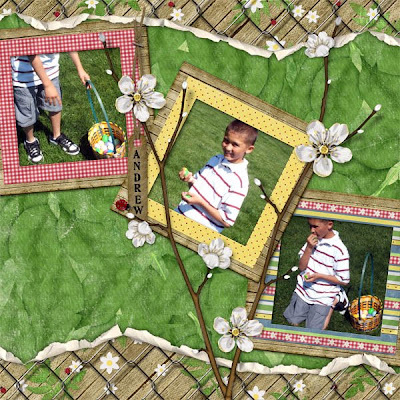 that I made last night after waiting for this INCREDIBLE kit to debut in the 3Scrapateers' store this past week. It is called *BLOCKZ* and it was SKILLFULLY created by Dede Smith. You WOULD not believe how MANY pieces of LEGO Dede has included in this MASSIVE kit!!! I will be using this kit a lot, especially when I am finally able to have a bit of time to go drag out my bins of photos from the closet! I had FUN!!! I got to play with my VERY own LEGOS!!! WOO HOO! Gotta LOVE all those BRIGHT "Lego" colors too! Sweet dreams y'all and have a BEAUTIFUL tomorrow - see you later alligators!!! I will be catching up with e-mails and comments throughout the weekend and into the beginning of next week as I have several collaborations due over the next few days and I shall, hopefully, be maddogging it to get 'em done! Tink, I hope that you are well-rested and enjoying your grandbabies (dont' tell them I said that!!!). Carole dearest - hoping and praying you've received GOOD news from your MRI's - calling you tomorrow! OMGosh!!! Y'all have made my day!!! Well, okay, let me rephrase that - y'all have HELPED to make my day!!! I had to change that up a bit as I did get to spend nearly an hour with Kaleb this afternoon! I had one of the twins take me up the hill (the other one came along too!) to Angels Camp to pick up my Armour Thyroid. They only had four of them on Thursday to hold me over until they received more today ONLY they did not! So the assistant had to rewrite the prescription for double the quantity of half the dosage, which is all they had available. I told them I did not care just as long as I was getting some! She asked how it was doing for me and I told her that so far, WONDERFULLY well! When I asked why they were having trouble getting more in, I was informed that they are having a bit of trouble keeping up with the demand. Now that right there is a SWEET morsel of information, eh? IT WORKS! I will try to remember to share a little bit more on that from some information I read the other day. I should also remind myself to post the links for any of you that might be interested in reading some excellent tidbits on one's TSH readings. Anyhoo, Mark and Jess just live a hop, skip and a jump (yes, we WERE driving a car!!!) from the pharmacy and they had just arrived home from the hospital. I had been keeping tabs with Mark throughout the morning and early afternoon to make sure that we did not end up going to the hospital only to find them gone! Tis a LONG drive!!! This worked out VERY well as Luke needed to get back home fairly soon to get ready for work and to stop by and see his girlfriend as today is their 10-month anniversary!!! This kiddo has it goin' on as he remembers dates like I do! Funny thing too, Luke and Tessa will be celebrating one year together on the same day that Jessica (Kaleb's mommy) celebrates her birthday!!! I was able to take some photos of PRECIOUS Kaleb with the natural lighting coming in through the living room window as suggested by my dear friend and our occasional "scrapatit" provider, Bonnie Beechler!!! Thank you for the reminder Bonnie as Kaleb was born under artificial lighting and I was a bit frustrated that I missed him as he took his FIRST little breath. WHY you ask? Because MY camera, for some reason (how much you want to bet it's lack of knowledge on the operator's end???) will not take a clear photo without flash on the automatic setting and someone here is waiting to take a digital photography class when she can find a bit of time to devote to it!!! Looks like I am being motivated to FIND that time, doesn't it!!! ROFL! I will upload some of those photos to the slideshow sometime tomorrow. My eyeballs are starting to hurt!!! Kaleb has such beautiful coloring that reminds me of my firstborn. Interesting as they both had a touch of jaundice. No biggie. I have SO enjoyed reading all of the DELIGHTFUL different ways you and your LOVED ones have of expressing LOVE to another and I shall be making note of them! How many of y'all remember Art Linkletter? Wouldn't it be AWESOME to have another host as remarkable as Mr. Linkletter to interview young children? Out of the mouths of babes! He was simply AMAZING as I look back and reminisce the days of old!!! Hmmm .... that has me thinking now! How about we share some of the MOST remarkable things we have heard our children, grandchildren, nieces, nephews, etc. say that has either left us in stitches, perplexed or with raised eyebrows and bulging eyes!!! I will start with two different "out of the mouths of babes" from my oldest daughter, April. The first was when she was all of about two years old. Most of us know that our firstborns are generally VERY bright and usually learn at a fairly quick pace as they get ALL of our undivided attention. Well, April was every bit of that and earned quite the reputation for keeping Mommy and Daddy TOTALLY baffled! One day she popped out with something that I was not quite understanding OR I had NO idea where it came from or what it meant. I will spell it out as best I can so you can get the gist of my perplexity - LOL! "Peace molly hops"! Yep, three little words that would soon go down in history in the Walton household!!! I would have April repeat these three little words HOPING that the little girl who was SO articulate, had finally found something a bit too challenging to pronounce correctly!!! HA, HA, HA, HA!!! I SO wish I had video of this event. I finally gave up and said to her, "April, you have Mommy and Daddy TOTALLY baffled"!!! WOO HOO! Did she pick that up and run with it. Little stinker would go around at any given moment .... "Peace molly hops - I have Mommy and Daddy TOTALLY baffled" with the BIGGEST little smiles and burst of chuckles. I shall NEVER forget those three words! The second was April at the age of 11 shortly after I gave birth to the twins, which were number five and six! "We" had not planned on having any more after my second son, Mark (Kaleb's daddy) was born!!! April heard either her dad and I casually talking or her dad on the phone making the comment that we had not planned on any more after the fourth. WHOA! April chimed right in and with out batting an eye or missing a beat, replied - "Mom, you and Dad can make all the plans you want, but God has the final say so"!!! I looked at her in utter amazement and told her that she was EXACTLY right about that!! !